Has it ever occurred to you that the air you breathe could be filled with particles and all manner of debris? With even a filter in place, the air you breathe can become infiltrated with smoke, pollen, mold, dust, dander, chemicals, and other debris. EPA studies of human exposure to air pollutants show that indoor pollutant levels may be 2-5 and even up to 100 times greater than outdoor pollutant levels. The best way to ensure clean air is to have a professional air duct cleaning for your home or office. Ducts may be full of insect or rodent debris. Contaminants that are pest-related can flare up allergies, asthmas, headaches, and other sinus conditions in delicate cases. Those with breathing issues, allergies, and lung diseases can be chiefly sensitive to indoor air infiltrated with disease-causing biological agents. In cases of insect and rodent debris, contaminated air systems can become breeding grounds for bacteria contamination within a home. Excessive dirt and debris are clogging your ducts. Many common allergies may be aggravated when dust, pollen, dander, and smoke particles enter the home. These indoor pollutants can cause nose and throat irritation, congestion, sneezing, coughing, and other symptoms of asthma. Continuously having these particles in the air can make the danger of radon gas even more apparent. Radon gas particles can attach themselves to the dust and other debris and create a situation where when inhaled, they can enter and become lodged in lung tissue. You can see mold growing inside on hard surfaces within the ducts. Mold, mildew, and other fungi can cause many issues in the home. Microscopic spores that can travel on air currents into the home produced by the micro-organisms within your ducts. They can be so small that you cannot distinguish when they enter the home, or the lungs as one inhales. These microscopic spores can cause a variety of ailments from nose and throat irritation to eye and skin irritation. In cases of extreme mold and mildew, some studies have linked mold to the asthma development in children. If you have someone with chronic lung diseases in your home it may be even more crucial to keep air ducts clean and free of mold, due to a greater risk of fungal infections according to Centers for Disease Control and Prevention. In a residential air duct cleaning field study performed in nine single, family dwellings, the EPA found that ADC has a positive impact and increased supply air flows by 4-32% within separate dwellings. 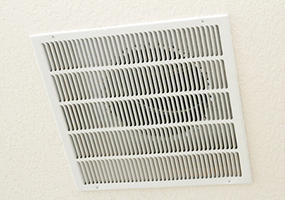 When the service is performed correctly, the air duct cleaning services should make a noticeable difference. Remember to always ensure your provider is trusted and provides trained and skilled air duct cleaning professionals, like Hitchcock’s team. Keep in mind that particles may enter your home from other sources than air ducts. An air duct cleaning will substantially help with creating an environment of cleaner air, but other sources may affect the air as well.